Welcome to the 11th day of our Fourth Annual Macabre Month of Horror. 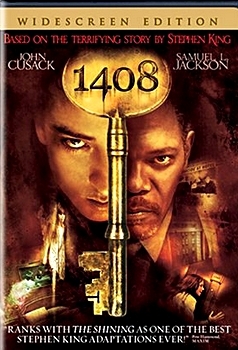 Today’s review is a Jumping Off Point review on the movie “1408” Based on a short story by Stephen King, a man who specializes in debunking the paranormal checks into the infamous room 1408 in the Dolphin Hotel, only to discover… the terror is real. Please keep in mind these are Horror Movies and the video reviews contain content from the films that may not be appropriate for younger viewers, or those with a weak constitution for that matter. Remember to visit every day for the latest video review. Or just subscribe to our posts by entering your email over where it says SUBSCRIBE on the right hand side of the screen and get our posts in your inbox. If you like what Sam has to say about the movie and want to watch it for yourself, CLICK HERE to see it via Amazon instant video.